LESLIE, George Frank (1837-1865) was born in Lowell, Massachussets in 1837. On September 25, 1862 in Santa Barbara, he married Nancy Ann Nidever (1842-1917), ninth child of John Marion Nidever (1796-1873) and Mary “Polly” King Vernon (1808-1871). George Frank Leslie and his wife, Nancy Ann, had son, George Grant Leslie (1864-1937), who was only a year old when his father drowned in the Santa Barbara channel in 1863. George Grant Leslie married Catherine Cagnacci in 1911, and they had three children, the youngest of whom is James Vincent Leslie (b. 1929). 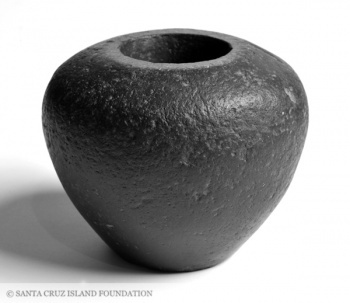 Today, a donut stone owned by Juana Maria, the lone woman of San Nicolas Island, has been passed down in this branch of the Nidever family. 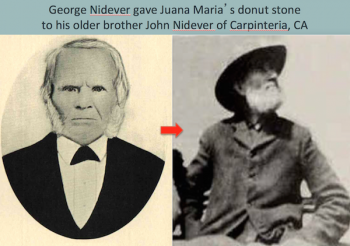 John Nidever was the older brother of famed otter hunter, George Nidever, who removed Juana Maria, the Lone Woman, from San Nicolas Island in 1853. 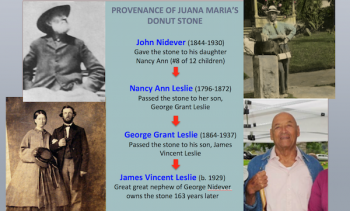 George Nidever gave his older brother, John, a donut stone that had belonged to Juana Maria. That stone passed down through John Nidever's family through his descendants to James Vincent Leslie. This page was last edited on 27 February 2018, at 20:59.